1/3 is a symbol for a set of 4 words, it is not a NUMBER. Only a single number CAN POSSIBLY = 1. Other numbers may ADD UP to 1, but they don't EQUAL 1. Since 1 clearly = 1, .99999 repeating simply cannot equal 1. .99999 does not equal 1. It might in the CURRENT UNDERSTANDING of mathematics, but that don't make it true. Mathematics cannot even prove that .99999 ... is not equal to 1. .9 repeating, an irrational number, is ABSOLUTELY EQUAL to the rational number 1. Can this be used as proof to show there is no such thing as irrational numbers? I think I've come to the conclusion that .999... = 1 in the same sense that .333... = 1/3. Which is to say, it doesn't, quite, but we treat it like it does because our decimal system has problems. 0.9 recurring does not equal 1. Why? Because it's 0.9 recurring. 1 = .9 repeating IF WE WANT IT TO. so does that make 2.999 mean <3 or =3 ? it's very irrational and so unattainably specific- gah. I feel lost but I very much like this. where h is the maximum tsunami-wave amplitude (in m) measured by a tide gauge at a distance R from the epicenter, a, b & D are constants used to make the Mt scale match as closely as possible with the moment magnitude scale. I'm not good enough at maths to argue all these points as accurately as I should, but I'd heartily recommend David Foster Wallace's "Everything and More: A compact history of infinity" (http://books.google.co.uk/books/about/E ... edir_esc=y) which'll do the job much better than I can. The short of it is, no, contemporary maths has pretty much got its head round infinity, although it still totally messes with the human mind. Some of the problems you talk about (all of which are rooted in Zeno's paradoxes) got nobbled by Newton, and most of the rest got mopped up by Cantor. That's sort of what Pythagoras said about the square root of 2. The way we deal with this now is by talking about different sets of numbers. 1/3 is not a natural number, it's true, but it is a real number. Root-2 belongs to the set of irrational numbers. This is a tautological argument. Yes, only one numerical value can equal 1. But the two symbols 0.999r and 1 are different symbols for the same numerical value. Bothy = 1. No, it's a rational number, because it can be represented by 1/3. Irrational numbers are numbers which cannot be represented by a fraction of integers (-2, -1, 0, 1, 2 ...), like root-2 or pi. Your computer couldn't work without it being true. Also, all the planets would spin out of orbit. Newton proved that it is (and Leibniz, possible at the same time). That's what calculus is for. Almost all post-Newtonian inventions depend on maths learning how to cope with infinities through integration and differentiation; almost all post-Cantorian inventions depend on learning how to cope with the resultant paradoxes through transfinite numbers. Infinity is at the heart of modern technology. First, 0.999r is not necessarily an irrational number. I can't remember how to prove whether a number is or is not irrational, though some judicious wikipediaing might help. But given that you argued that 0.333r is irrational when in fact it is perfectly rational, you probably want to swot up on what irrational numbers are anyway. An irrational number will never be equal to a rational number, because they are totally different sets, but complex numbers or even sums and powers and multiplications of irrational numbers can quite happily be rational. See, for example, e^1(pi)=-1. As for "no such thing", well, that depends on whether you think numbers exist or not. Fortunately, the maths works regardless of your philosophical stance on this question. Yes, they're the same type of decimal: the ... is important because it indicates that both are an infinite series. 0.999r=1 and 0.333r=1/3 because, after Newton et al, we know how to sum an infinite series. You say this because you're not quite sure what an infinite series is. The argument you're making here is exaactly the argument that many of Zeno's paradoxes make. If 0.999r does not equal 1, Achilles can never overtake the tortoise. See response to "no such thing" above. 2.999 is less than 3. But 2.999r or 2.999... = 3. Now I'm actually being pedantic, but it's a useful point: you're conceiving as 2.999... as just 2.999 with lots more 9s. It's not. It's 2. with an infinite number of 9s. Infinity is not a very large number. It's a totally different type of thing. Actual maths at first glance may seem more boring than exciting and wild philosophical epiphanies, but the excitement lasts much longer. 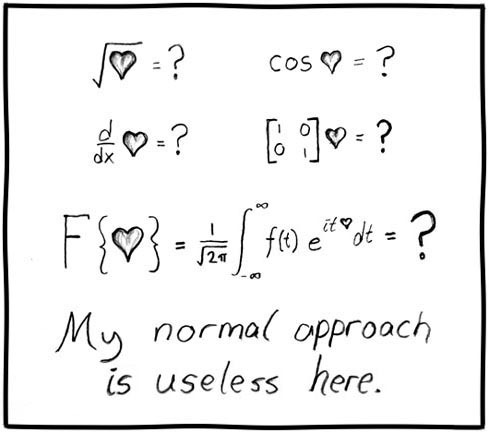 But that maths is unable to comprehend love doesn't mean maths is unable to comprehend maths, and you don't need to argue the former in order to demonstrate the latter. Or, to put it another way, infinity is one of the things I love and get excited about, so I can't help talking about it if I get the chance. i should have wrote some stuff with last year's valentine then maybe the intended would have responded, and i would have known they read it. i intentionally posted it in technology for the purpose of drawing the attention of someone... though i know it would have been seen regardless, i figured a post in technology, esp. by me, would have drawn more special attention. i'm just publicly flaunting a private thing because i'm obnoxious like that. HGiles wrote: infinity is one of the things I love and get excited about, so I can't help talking about it if I get the chance. I rarely do the whole real life laugh out loud whilst typing LOL but... LOL. Sounds a lot like the zen maths of Douglas Hofstadter in his book Godel, Escher, Bach. Now there's an afternoon or three's reading.